Blue - The standard cursor. Red - Indicates an exit. Broken - "Non-active". Means that you cannot currently interact with the scene. - Mouth - Talk to or use mouth to interact with an item. - Hand - Interact physically. Use this to pick up items and add them to your inventory. Right-click to open your inventory. Press the letter X to show all possible exits. Press again to take down the exit signs. Items will flash when they can be used on the scene, or when there's a possibility to combine items. F2 - Quick-save; F3 - Quick-load. There are 99 save-game slots available. You MUST SAVE before exiting to the main menu! F5 - April's Diary (have to learn how to use it in-game before this will work) - Can save and load from here, too. There are also options for High Quality April Model, Special Effects, Shadows, High Quailty Video, and Enable Time Skip. I had all of them checked except the last one -- not sure what that one's for If you have any trouble with things lagging, try turning off some of these extras. The manual (see PDF link further up in the post) will explain what all of these options mean. On the main menu of the game is something called the Book of Secrets, which we can't access. There is an easter egg that will allow us access, and it is described (with HINTS on how to do it in spoilers) in THIS POST. The Book of Secrets contains BONUS CONTENT for the game, including outtakes (audio of the actress playing April messing up -- very funny! ), eight music tracks (which you can listen to, but not save to your computer), and a bunch of very cool concept art! The graphics looked great stretched to fit my widescreen. As RenaissanceMom mentioned, the character design is pretty dated, but this didn't detract from my enjoyment of the game in the slightest. The story really draws you in, and while not an intense experience like Cognition, The Longest Journey is compelling, and I found it hard to stop playing! The game is set in the future, but it's a future that's easy to relate to -- it's not heavily sci-fi, and there's a strong fantasy aspect to it. As a matter of fact, the separation of sci-fi and fantasy is at the core of the story, and brilliantly handled. The game took us places I NEVER expected to end up, and is all the better for it! While I did have parts of the story figured out, I also was surprised more than once! Rmom and I both got TLJ from GOG, and we both experienced the same glitch: The game closing down when we tried to access a certain scene. TO GET PAST THIS GLITCH, single-click on the exit to take you to that scene. Every time I was trying to run to the next location (by double-clicking) and it crashed, but walking got me past the glitch. After you get past it that one time, you'll be able to double-click to run to that location as usual. This would be a good time for me to remind you of the importance of SAVING! Remember that you can speed things up by double-clicking to make April run, and the other shortcuts at the top of this review will be a LOT of help, believe me! I really enjoyed the time I spent on this game, and absolutely recommend it... Assuming that you don't get irritated by LOTS of conversation and reading. 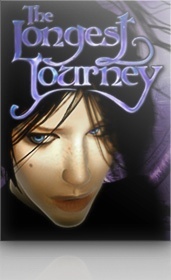 The core of The Longest Journey is the story, and it is absolutely integral to your enjoyment of the game!